The Russian Revolution in 1917 first abolished the Empire of the Tsar and later "the provisional government", striving sporadically for a democratic form of government. These upheavels ignited the Russian Civil War, which ended as late as 1922. The struggles of various political movements to repress the revolutionary government, and the battles of different greater and lesser powers on Russian territory against each other and the parties of the Russian Civil War, were combined in the battles of this war. The Russian Revolution in February and March 1917 shook the foundations of the traditional order, but there were no big internal battles until, in September, General Lavr Kornilov began the offensive against St Petersburg, reinforced by army detachments. The temporary regime armed the workers and succeeded in checking this attempted coup. 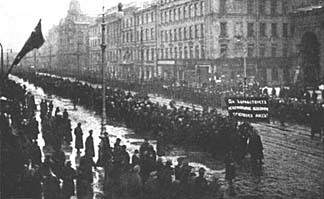 The October Revolution, carried out by the radical socialistic parties (6-7 November, 1917) wrested the power out of the hands of the provisional government. The New Soviet Government, with V.I.Lenin at its head, prevented the Constitutional National Assembly elected by the people from convening.